Want to run Google Ads campaigns but don't know where to start? 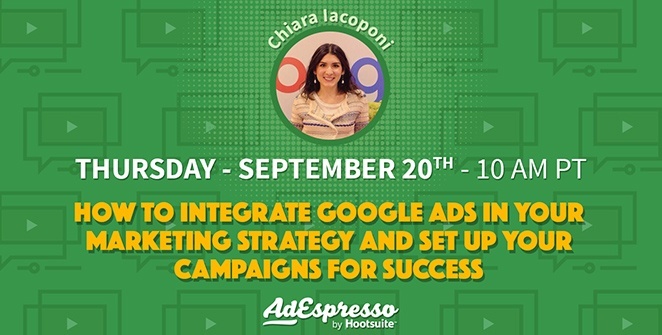 Join this webinar on September 20th with Chiara Iacoponi, senior Ads strategist at Google, to learn how to add Google Ads powered by AdEspresso to your digital marketing strategy. Today's customer's online behaviour has completely revolutionized the concept of customer journey, which has become more fragmented than ever before. Users are constantly connected, moving across devices, platforms and exposed to increasing amounts of information while making purchasing decisions. From a marketing point of view, this shift in consumer behaviour calls for integrated marketing strategies across media, in order to be as effective as possible throughout the entire marketing funnel. Google Ads offer a wide stack of powerful solutions to intercept and interact with potential customers along the different stages of their online journey. In this webinar, we will present Google Search Ads, a foundational component any digital marketer should include in her/his strategy. Google Search Ads allow advertisers to get in touch with "high-value users", i.e. those that are showing a strong interest towards a certain product / service and are actively searching for it online! To integrate Google Search Ads within your marketing campaigns and set them up for success, there are few key golden rules that we'll guide you through during the webinar. We will see together how to boost campaign performance while optimizing costs, by structuring campaigns at best, writing compelling ads that drive users to act and selecting the right keywords to bid for the most relevant queries. Looking forward to apply all these best practices while planning for the next seasonal peaks? Sign up for the webinar today!